The heroism of an entire nation reminds us that there was pride and human decency in the world even during a time of terror and war. I remember when Lois Lowry’s [amazon_link id=”0544340000″ target=”_blank” ]Number the Stars[/amazon_link] as teenager. She was a favorite author of mine who always moved me. She still does today. I can’t believe it’s been 25 years since Number the Stars was published. This is an important work of historical fiction. The bravery of the characters brings the Holocaust to life for juvenile readers as they imagine themselves courageously aiding Jews out of Nazi-occupied land. The evacuation of Jews from Nazi-held Denmark is one of the great untold stories of World War II. On September 29, 1943, word got out in Denmark that Jews were to be detained and then sent to the death camps. Within hours the Danish resistance, population and police arranged a small flotilla to herd 7,000 Jews to Sweden. 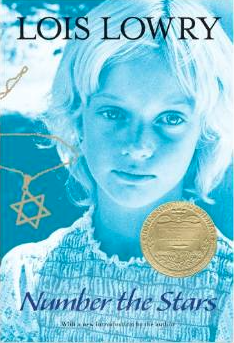 Lois Lowry fictionalizes a true-story account to bring this courageous tale to life. She brings the experience to life through the eyes of 10-year-old Annemarie Johannesen, whose family harbors her best friend, Ellen Rosen, on the eve of the round-up and helps smuggles Ellen’s family out of the country. Number the Stars won the 1990 Newbery Medal. Even if you are an adult, if you have never read this book, I highly recommend it. It shows the true spirit of the goodness of humans when evil seems to prevail.